Do we get the bottom (ICL - Intermediate Cycle Low) this week? That is what I expect as the 9 month bottoms along with the shorter embedded cycles. 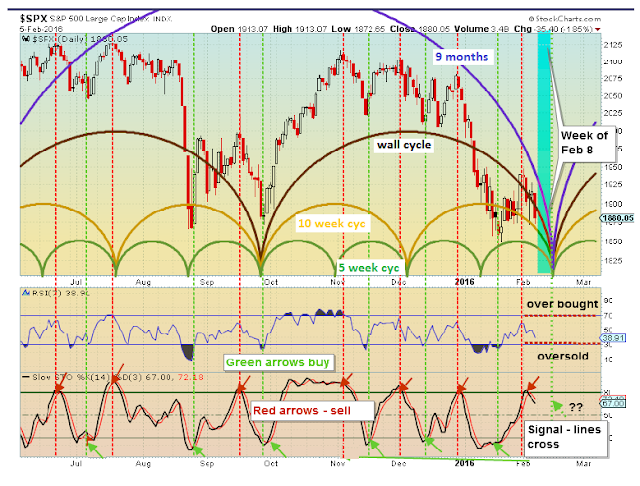 There is a potential of longer cycles also bottoming during Feb-Mar time span (covered in previous posts. I posted in my blog http://baritrader.blogspot.com.es/ my trading week, and mention your blog an your excellent analysis. Glad you find my comments/analysis helpful in your analysis. I am not always right, but right often enough to be helpful I think. Good luck.